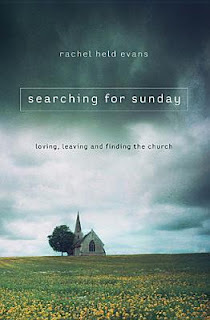 I think Rachel Held Evans' goal with her book, Searching for Sunday, is to help the reader fall back in love with the church--that is, the universal/international/global church; as in the body of believers that makes up Christ's bride. I don't know if it helped me in that at all. I think it was meant to show me the beauty of the church, and there were definite glimpses. But Rachel described to me the indescribable: the mysterious beauty of Jesus Christ and the person he could be to me. She made me want to love Jesus again. This is the account of Rachel's journey through loving, leaving, and finding the church again--this is how she chooses to portray that journey. Each of the seven sections hold chapters that bring out each sacrament in all of their unearthly beauty. I was captivated by every word, sentence, and page. More than once, this account tugged at my throat and brought tears to my eyes. I expect I'll be coming back to this book over and over again in the years or--Lord willing--decades to come. When I find myself floundering, lost, and falling away, Rachel may have found the words to prop me back up on my feet again. For more information on Searching for Sunday by Rachel Held Evans, visit our website here. "That's why she had me write a bucket list... twenty-five things that will make my future brighter, that will stop giving my memories so much power over my life. I've been in therapy for seven years, but I still struggle. Not every day--like at the beginning. But sometimes still, the memories sneak up on me when I least expect them. They drag me down and pull me under like a riptide. And even though I long to fight them, my arms and legs gets tired. I grow weak. In those moments, I'm maybe kind of okay with letting and drifting away, allowing the sea to carry me wherever it wants to go. But now when that happens, I have a new tool. I can try and focus on the dreams, the plans, the goals I have. And say, "Not today. I won't let you rip them from me." It's not necessarily about avoidance or forgetting. There are some things you never forget. Instead it's about learning to swim parallel to the shore, to be one with the waves, with the pain. To replace weakness with strength, fear with hope. Hope can be my rescuer. If I let it." Megan Jacobs was born with a weak heart, and spent her childhood in and out of hospitals while her twin sister lived the perfect life, playing sports, getting the guys, and having fun. Flash-forward to her adult years, Megan has received a heart transplant, but still lives in constant fear. When Megan's heart donor's parents give her their daughter's journal, she is drawn to the young woman's unfulfilled bucket list. Megan decides to take a leap of faith and complete the list, but it is the biggest shock when her twin sister decides to join her on this trip of a lifetime. While the two estranged sisters visit Inca ruins, tour a Celtic castle, and swim near the Great Barrier Reef, it is here where Megan finally fights the fears and resentments of a lifetime of illness and even begins to see the less perfect side of her sister. Running with the bulls in Spain is one thing, but can Megan risk opening her new heart to her sister, and maybe allow herself to fall in love and pursue her dreams? I don't often read realistic fiction, I prefer historical fiction or biographies. But I decided to shake things up a bit and see if this book surprised me. It spoke great volumes to me, although it wasn't the most amazing book I have ever read, it brought up past memories and experiences that I've buried down for a while. The prologue spoke to me on a very emotional level, not just for myself but it helped show me a perspective of a family member. The novel weaves Christ’s transforming power of reconciliation and demonstrates His love through our everyday walks of life. And I think sometimes a book isn't meant to move or change oneself, but it can help you change your perspective on a matter and shed light onto another's life. We are called to live out out Christ in every aspect of our lives. All we need is the courage to take that first step forward. For more information on The Heart Between Us by Lindsay Harrel, visit our website here. This is book one in a two-part series called Beyond the Circle, and the second book is supposed to release this Fall, 2018. I snatched up The 49th Mystic and finished it in two days, and while it did start slow, the signature breakneck-pace that I've come to expect from Ted Dekker shone through. At about the 1/3 mark, the story really picked up and didn't stop again until the very last, exquisite, jaw-dropping, cliff-hanging page. The 49th Mystic follows a young blind woman named Rachelle who dreams of the same world where Thomas Hunter fell through some years ago. The desert, the Horde, the Albinos, the Roush, the Shataiki--everything that makes the world of The Circle--shows up again in this hugely-anticipated sequel. Dekker takes his time at the beginning setting his stage and introducing Rachelle to the two worlds, and then he takes us on another ride-of-our-lives adventure that won't stop until several months from now. I don't know how I'll hold out until the fall to find out what happens next, but I'll be there, clawing and drooling or whatever, as soon as the next book is out. For more information on The 49th Mystic by Ted Dekker, visit our website here. I had the privilege about five years ago to meet Bob Goff. If you are familiar with Bob and his book Love Does, he talks about his lodge that he and his family built up in an inlet on the Sunshine Coast of B.C. It so happens, there is a Young Life camp maybe a mile away from his lodge. While working up there as a Summer Staffer, on one of our days off we got to go to his lodge and sit in his living room and hear him tell his amazing, and often crazy, stories. I think we got this opportunity because Bob's son Adam was on my Summer Staff team. It's one of my absolute favorite memories from one of my favorite summers. If you've ever wondered what Bob is actually like, stop wondering. If you've read either Love Does or Everybody Always he is exactly the same. He writes exactly how he talks. And he's the most hilarious, loving, excited-about-life guy I think I've ever met. Reading Everybody Always is like sitting at a table in a coffee shop with Bob while he tells you story after story with little lessons thrown in. And although the lessons might seem little, they pack a serious punch. What seem like big ideas and theology the church sometimes throws at us, Bob simplifies it in such a way, that loving people that bug us or loving people we don't understand doesn't seem like such a hard thing. Everybody Always is all about "becoming love in a world full of setbacks and difficult people", and what that actually means. All Jesus wants us to do is follow in his footsteps: Love EVERYBODY, ALWAYS. We don't have to agree with everything someone says, but we do have to love them anyway. They could be fifty kinds of wrong and annoying, but we're supposed to love them anyway. In a world that is very concerned about sexual identity, feminism to the extreme, and whether you're a Democrat or a Republican (I'm American and this has been a HUGE deal in the last few years), as Christians, we are called to love everyone always. I've repeated that a lot, and Bob does too in this book, but it's so so so important and I don't think many Christians have loved everybody always. I haven't. Many want to be right, so they argue and fight and demean. But that's not at all what Jesus taught or wanted us as his followers to do. This book is fantastic and hilarious and convicting and so important. 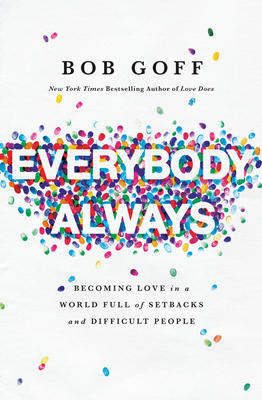 For more information on Everybody Always by Bob Goff, check out or website here or come in store and check us out!